The night before her father dies, eighteen-year-old Jeannie Vanasco promises she will write a book for him. But this isn't the book she imagined. 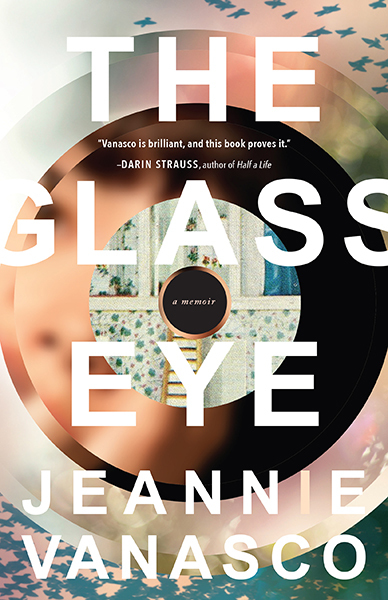 The Glass Eye is Jeannie's struggle to honor her father, her larger-than-life hero but also the man who named her after his daughter from a previous marriage, a daughter who died. It is also an examination of the author's lifelong battle with crippling bipolar disorder and depression. ...[a] brilliant, obsessive memoir about grieving ... Reminiscent of Maggie Nelson’s The Argonauts, The Glass Eye isn’t a straightforward memoir: Rather, it’s a self-aware chronicle of her struggles as she talks us through her process on the page ('I worry I’m too easily swayed by the sonic impact of a line') or researches the sparse facts of her half sister’s death. As the pages fly by, we’re right by Vanasco, breathlessly experiencing her grief, mania, revelations, and — ultimately — her relief. She writes vividly of the exposed-nerve pain of losing a parent at such a tumultuous age ... The language cuts quick to the heart of Vanasco’s hurt; readers will immediately fall into the rhythm of her unrelenting inner dialogue. The greatest strength of this work is the author’s self-awareness; she admits that writing a memoir about her experience with grief might be further contributing to her personal turmoil. Vanasco’s candor, curiosity, and commitment to human understanding are not to be missed. Jeannie’s obsessive quest to fit her father’s and her half-sister’s life into some sort of coherent, meaningful narrative both provides the book with its exploratory thrust and, in its paranoid excesses, fuels her encroaching mental illness ... At the end of The Glass Eye, Jeannie has a startling realization that rearranges her perspective on everything she’s told us. 'I used Jeanne as a metaphor,' she admits, echoing Bouillier and Palm before her, 'as a means to understand my dad’s grief, as a means to understand who he was, as a means to understand how I should grieve. I don’t know how to grieve.' And then, in five quick words, Vanasco flips the assumptions underlying her entire project: 'Jeanne was a real girl,' she writes, which is to say: not a symbol, not mere material. This is an essential realization, a way out of both madness and literary narcissism, and yet, no matter how real Jeanne was, the act of writing reduces her. Jeanne may be 'real,' but the second you put her on the page, she cannot help but become a metaphor. With this, every memoirist must reckon. What did you think of The Glass Eye?